Bee Cave Chiropractors Welcome You! As a Certified Chiropractic Clinical Neurologist, Dr. Susan is trained to work with brain injuries and neurological conditions. We utilize a wide variety of chiropractic techniques, chosen based on your particular needs. Rao Family Chiropractic & Wellness Center is definitely family-centered; they provide chiropractic care to newborns, seniors and every age in between. Their deeply ingrained personal and professional philosophy of “love all, serve all,” is demonstrated on a daily basis as they endeavor to help their patients learn to care for themselves and to realize the importance of the nervous system and its effect on every part of the body. 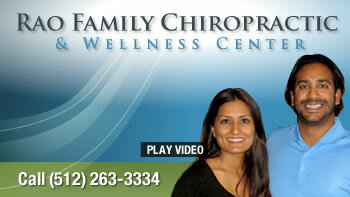 We’ll work to educate you on chiropractic care and keeping yourself healthy, living a life of abundant wellness. If you’re curious about chiropractic, read some of our patient reviews and check out some well-known people who have advocated for chiropractic. Contact us today to get answers to any of your questions, or to schedule your appointment with our chiropractors Bee Cave and warm, welcoming team! Thank you for seeing me so promptly! Even though I walked in, you saw me because I was in pain and you helped me completely! Best experience I’ve ever had at a chiropractic office. Staff, Dr Rao and practice are all very efficient. It takes skill and knowledge to achieve that. Thank you! I was very impressed. You were very highly recommended from friends at the Austin Area Birthing Center. Friendly staff. Dr. Rao was very informative. Antoinette and Dr. Rao were efficient without being rushed and immediately set me at ease. I really like Dr. Rao’s approach and his adjustment style. The office staff is wonderful m. I just wish I’d found this practice years ago! Everyone is very friendly and helpful. Dr. Rao was professional and friendly. Nice to get to know him. Great experience! Excellent, engaged staff and Dr. Rao was excellent. I’ll be back! His reputation proceeds him. Truly a great practitioner and his facility is world class and his people are professionals. I love all these guys, they are the best!! Excellent team all around!! Dr Rao and Nina were both extremely caring and professional. Thank you for helping me feel much better! Glad I chose to make my 1st appointment with Dr. Rao when I did. I took my 6 weeks old because he couldn’t move his neck both ways. I already see a huge improvement! I love this whole office! Super impressed all the way around!! A sense of “wellness” was felt throughout my entire visit! A very nice doctor and super friendly staff! Very clean and professional site and staff. This was my first experience with a Chiropractor and I was very satisfied.